Painter, part of a German family of artists. 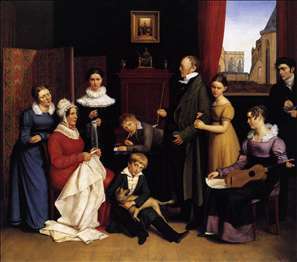 For more than a century, art life in Berlin was influenced by six members of this family: the painter Carl Begas, his four sons and a grandson. The forefathers of the Begas family apparently came from Spain via the Netherlands, and an earlier spelling of their name was Begasse. Carl Begas first trained at the Lyceum in Bonn under the painter Clemens August Josef Philippart (c. 1751-1825). In 1813 he moved to Paris, where he studied until 1821 with Antoine-Jean Gros, from whom he absorbed the Neoclassical principles of composition and drawing combined with a proto-Romantic painterliness and warmth of colour. Begass Self-portrait with Johann Peter Weyer (1813; Cologne, Wallraf-Richartz-Museum) and his Self-portrait (1820; Berlin, Neue Nationalgalerie) exemplify the style of his early work, revealing a Romantic influence in the rather moody and introspective gaze of the sitters. While in Paris, Begas also began painting religious subjects. These attracted the attention of Frederick William III, who purchased various pictures and, in 1818, commissioned an altarpiece for Berlin Cathedral, Descent of the Holy Ghost, which Begas painted in the style of Raphael. A stipend from the King financed Begass final three years in Paris. He was engaged to paint several large Biblical pictures and he continued to produce paintings which were placed in the churches of Berlin and Potsdam. Begas was also celebrated as a portrait-painter, and supplied to the royal gallery a long series of portraits of eminent Prussian men of letters. At his death he held the post of court painter at Berlin. See more details about "The Begas Family"